It took some time to get in contact with Marco Casolanetti who runs together with his wife (I guess) a beautiful vinery and agricultural pension. No response on any email, many left messages on the answering machine and even the idea to contact them via fax didn’t succeed. As I was on my way to the South of Italy and would pass the village with the name Cupra Marittima in which the mentioned vinery named Azienda Agricola Oasi degli Angelis should be located. You need to drive up a small but soften valley, just aside of the autostrada A14, so I decided to stop there. But I couldn’t find it – very frustrating! Only an hour later my assistant called me: “they call back, they call back…. after more three weeks!” This was even more frustrating as I just have been there. We agreed to visit them on my way back. This time I found it and I was so happy! By the first look you think – this is small but so beautiful. If you then spend an hour or more you realize that aside of the parent house there are modern – partly subterranean – buildings for wine production and of course a wonderful cellar. As individual Marco and his wife Eleonora are as much defined is their wine: uncompromisingly, amazingly complex with flavors of oriental spicery, matured and sweet black cherries but with an amazing freshness and coldness. It is maybe one of the most abundant and voluminous wines I know. Someone wrote that this wine has an exploding fruitiness. The most unbelievable is that this should be Montepulciano! If I wouldn’t know this and someone would serve the wine for a blind tasting I am sure that most of the people would think they drink an Amarone. Actually this is the only other wine I would compare it with. But only with the very best one. What else makes this wine so special? As rich it is as smart it is, as much tender it is as much it is mighty. Although I missed talking with Marco about the soil of this area there must be something special. It is chalky and red clay. During summer it can become hot, even though there is always a fresh and salty breeze from the very close Adriatic Sea. The little valley I mentioned has very rich vegetation and the agricultural landscapes in this area seems to be rather divided into small sections and pure nature. Last but not least and in this case I can say – of course – this wine is organic and biodynamic. Something really wonderful, amazingly passionate and incomparable! The colour of wine is dark red. If I were you, I would not eat anything aside except perhaps some cheese or ham as the wine by itself is the experience. The wine is so super that at the end I guess everything would taste well. Although I don’t know who guests can contact them but they rent out some rooms as well as you can get some food at Oasi degli Angelis. I had very good ham and cheese, just wonderful. I would be constantly drunken – by the wine, by the beauty of the countryside and the friendliness of both hosts. Although you would never have the idea that there is any connection between Cupra Marittima and Moscow, this wine does connect both places. The Bolshoi Restaurant is one of the flag ships of the impressive and successful chain of Novikov restaurants in Moscow (see at http://en.novikovgroup.ru/restaurants/bolshoi/). 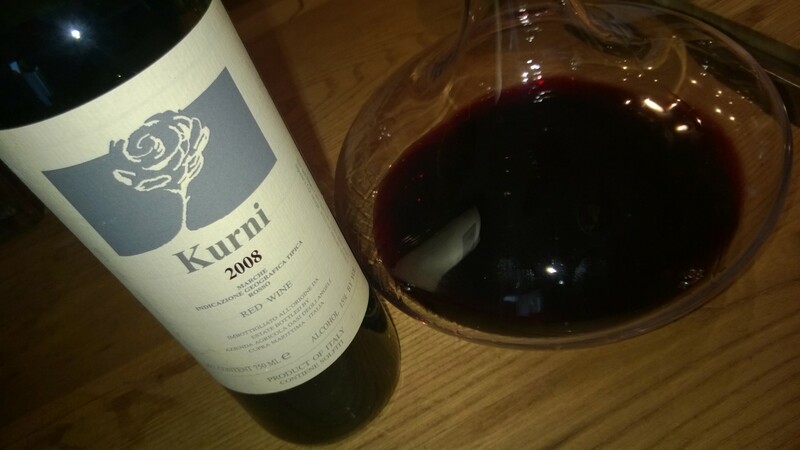 Novikov, an imposing Muscovite entrepreneur, himself or one of his sommeliers seems to be a big fan of Kurni since I do not know any other city in the world where you can find so often Kurni on a wine list. Bitter to say that it is mostly available as it is really too expensive – in Moscow considering what you would have to pay if you pick up the wine directly at the vinery. The difference is huge and countable by hundreds of dollars. The peace of the location, the unpopularity of the area, the passion of two outstanding winemaker, their remarkable knowledge of soil, grapes and handling also weather condition floats into only the best! Meanwhile Kurni has its own webpage! But don’t worry! It doesn’t work really: http://www.kurni.it/.